BCPC award for a life time working in crop protection - BCPC British Crop Production Council : BCPC British Crop Production Council . The BCPC Awards recognize outstanding contributions to UK crop production, in one or more of the areas of scientific advance, technology innovation, advisory and extension, education and training and regulatory affairs. 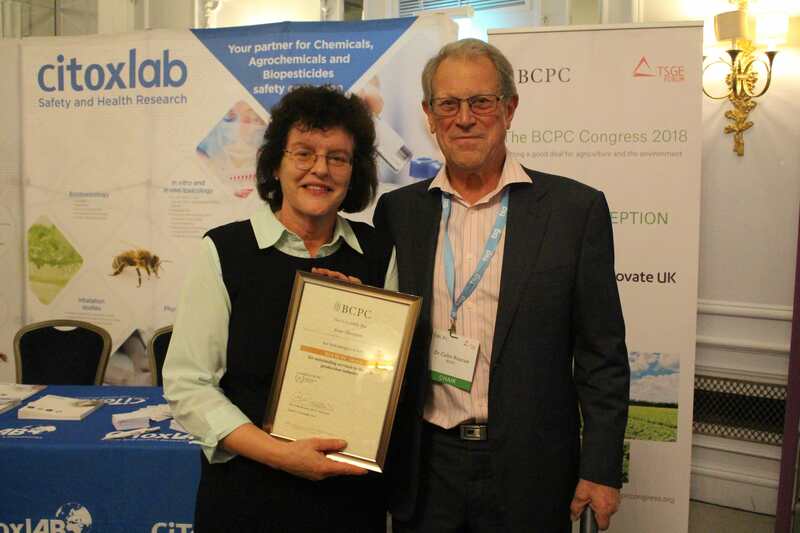 BCPC’s Executive Chairman, Dr. Colin Ruscoe, presented this year’s BCPC Award to Anne Thompson on Monday 13 November at the BCPC Congress, at the Hilton Metropole Hotel, Brighton. Anne Thompson grew up on a family farm and as a result developed a love of agriculture. After obtaining a BSc in Biological Sciences at Birmingham University she gained an MSc in Crop Protection at Reading University before starting work at AH Marks as a Field Trials Officer. In 1982 Anne joined Dow Agriculture and had a remarkable 36-year career with the company starting as a Technical Officer conducting field trials and advising farmers in the north of England. From there she moved to Hitchin as herbicide technical specialist and was responsible for the UK technical launch of fluroxypyr for cleavers control. In 1988 Anne made a move to the US, where she worked as a Weed Scientist in Minnesota focussing on maize and soybean. With the merger of Elanco and Dow she relocated to the Global Headquarters in Indianapolis and focussed on herbicide resistance. She became Chair of the European Herbicide Resistance Working Group for 12 years; this became the Resistance Working Group of the European Weed Research Society which she chaired for a further four years. She was also a member of the Weed Resistance Action Group in the UK. Returning to the UK in 1992, Anne became Technical Manager for florasulam, taking the product from early development through to launch across the globe and working with, in her words, some exceptional scientists. In 2001 Anne took on a role in development and regulatory for UK, Benelux and the Nordics where she drove acceptance of 75% low drift nozzles used in risk assessment and worked on a number of LINK projects. As well as her involvement in the resistance groups Anne has been the herbicide industry panel leader for European and Mediterranean Plant Protection (EPPO) guidelines for herbicides (1997-2005), a member of the biodiversity sub-panel of the environmental group of the ACP (2002-2004), member of the BCPC Weeds Expert Group, Industry member of the Indicator Group of the Pesticide Forum, Chairman of the Crop Protection Association (CPA) Regulatory Expert Group (2001-2006), Chairman of the CPA efficacy group (2015-2018) and member of the CropLife International Non-Target Plant Working Group (2000-2018).